Religious traditions from the ancient Middle East can be a rich source of creative inspiration for the modern-day dancer, poet, painter, or Pagan practitioner. The attributes, personalities, and stories of deities are often a mirror for our own human foibles, and many fascinating stories have come down to us through the centuries. This information about the goddesses of ancient Egypt may inspire your own creative interpretations. Rituals honoring Bast included light-hearted barge processions and orgiastic ceremonies. Her cult can be traced back to about 3,200 BCE, and she became a national deity when Bubastis became the capital of Egypt circa 950 BCE. One legend said Bastet accompanied the sun god Ra's boat of a million years on its daily journey through the sky, and at night she fought Ra's enemy, the serpent Apep. 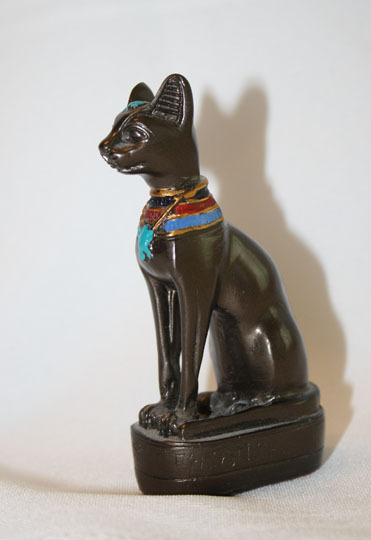 Bastet's name means, "She of the perfume jar," and therefore the first symbol in her name is that of a perfume jar. Another name for the perfume jar is a "bas-jar". This symbol can be written by itself to refer to Bast, or it can be followed by the loaf symbol which indicates that the feminine "t" sound should appear at the end of the name. The symbol of the seated goddess is also optional. In art, Bastet is depicted as either a cat-headed woman carrying a sistrum and basket, or as a whole cat. Often, in either form, there are kittens at her feet. Dressing as a cat, or wearing a cat mask. Incorporate music and dance into the character. Hathor was the Egyptian goddess of motherhood and all that is best in women. In her aspect as goddess of music and dancing, her emblem was the sistrum, an ancient musical percussion instrument. All Egyptian women worshiped her, from the queen to the lowliest woman of the land, and she was the protectress of pregnant women. Hathor was said to nurse the Pharaoh, the living Horus. This led to identifying the queen with Hathor, so the queen as chief priestess led the other priestesses, the concubines of the god, in the dancing and music-making which were their part in the temple ritual of Horus and the other gods. According to a story told on the walls of a shrine in King Tutankhamen's tomb, as the sun god Ra grew older, he became fearful of his enemies and asked Hathor to help him. She took on the job with a vengeance and turned into Sekhmet, the lioness goddess, and seemed to enjoy the killing. Ra then worried that she would wipe out the entire human race, so he had red dye mixed in ale and spread about the land. Hathor, thinking it was blood, drank it and became so intoxicated that she forgot her assignment and humankind was saved. Pacified by the beer, she resumed her persona as the beautiful Hathor and returned to Ra. The name "Hathor" means "house of Horus," and therefore in hieroglyphics her name is written as a falcon (representing Horus) inside a box that represents the floor plan of a house. According to legend, Hathor was the nurse of Horus the Younger, which is why she is often depicted as either a cow or as a woman with the head of a cow. In some temples, such as the Temple of Hatshepsut at Thebes (Luxor), a cow's head is carved at the tops of some columns to represent Hathor. See the example to the right. The Egyptian Museum in Cairo also displays many mirrors showing the cow's head on the handle. Although Hathor was the earliest goddess to be depicted wearing a headdress of cow horns with a sun disk, Isis later also was depicted with this style of headdress. In some cases, the only way to tell which goddess a particular image represents is to look at the hieroglyphics on the wall next to her, usually near the head. If Hathor, it will show the falcon inside the box. If Isis, it will show the throne. Wear jewelry made of the mineral turquoise, particularly turquoise beads made into the menit-necklace. In the desert regions of Sinai, miners seeking the mineral venerated Hathor, "The Lady Of Turquoise." Carry either a sistrum (a percussion instrument that became a representative cult object of Hathor) and/or an ankh. Wear a horned headdress with a cobra on the front. This might also include a circular red disc to represent the sun. Isis was celebrated at one festival called The Lychnapsia, the Festival of Lights, on August 12, to commemorate seeking her spouse in the darkness by torchlight, and her processions resembled those of Bastet. Isis was the daughter of Nut, wife of Osiris, and mother of Horus. When Set killed his brother Osiris and set his body adrift in the Nile, Isis began her search for him. When she found Osiris, Set learned of it and stole his body, chopped it into pieces, and threw it into the water again. Isis retrieved her husband and reassembled him. Because of her role in bringing him back to life, she usually appears in funerary scenes, either leading the deceased toward the afterlife (as shown in the photo of her with Nefertari to the right) or standing behind Osiris to greet the deceased. Isis instituted marriage and taught women the domestic arts of grain-grinding, flax-spinning, and weaving. As mother-goddess, she introduced the practice of agriculture. Her early character as the Great Enchantress was reflected in her magic powers and in her knowledge of the arts of medicine, which she and Thoth taught to humanity. Typically Isis' name in hieroglyphics includes the symbol for "throne" as the first character, and the symbol for "goddess" as the last one. The semicircle in between is a "loaf" symbol, which is pronounced like a letter "t". The literal translation of her name means, "She of the Throne," referring to Isis' position as Queen of the Gods. Sometimes the name is abbreviated to just the throne itself. Other possible spellings exist, but the "throne" symbol is common to all of them. Isis was often depicted in art nursing the infant Horus. With the advent of Christianity, many of the chapels of Isis were converted to churches, and images of Isis with her baby were reinterpreted to refer to the Virgin Mary holding Jesus. 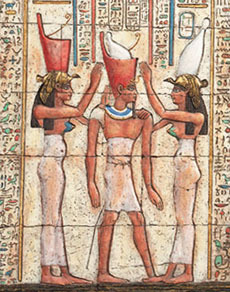 In funerary scenes, Isis and her sister Nephthys stand behind Osiris, as shown in the drawing to the right. Isis often appears with outstretched wings, as shown in the drawing to the right. 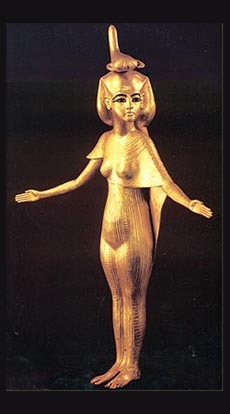 However, other goddesses such as Ma'at and Nut can also be portrayed this way. Many people incorrectly assume that every picture of a winged Egyptian goddess is Isis. It's necessary to look for other clues to identify which goddess it is. In this drawing, the throne-shaped symbol on top of the woman's head identifies her as Isis. Alternatively, the throne may appear with other hieroglyphics next to the image of the goddess. Consider using a red costume. Egyptians addressed her as "thou lady of the red apparel" and she is depicted wearing red in many of the historical images of her. Of course, she has also been depicted wearing other colors, so this is not a requirement. There are many works of art depicting Isis with wings. Isis is frequently shown with a throne perched on top of her head to represent her position as queen of the gods. Isis is frequently shown with a headdress that has a vulture resting on top of her hair, and on top of that a pair of cow horns surrounding a sun disk. Many images of Isis show her holding an ankh in one hand. The great temple of Isis in Nubia once resided on Philae Island, but when Egypt decided to build the Aswan High Dam during the Nasser era, the rising flood waters threatened to bury it forever. An international engineering effort moved the temple from Philae Island to its new home in the city of Aswan, where it now resides. The earliest surviving texts found that mention Ma'at date from the Old Kingdom, around 2,780 - 2,250. 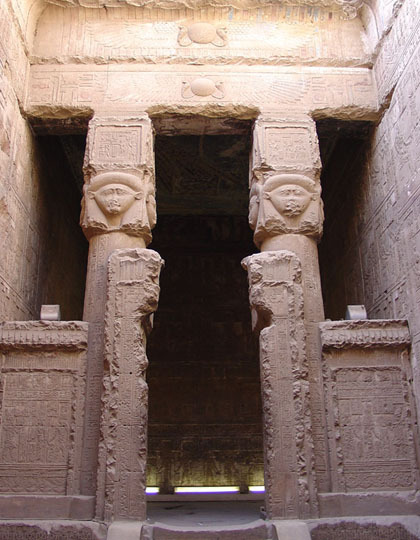 The only known temple dedicated to Ma'at which has been found so far appears in the Karnak complex at Thebes (Luxor). Texts indicate that other temples to her may have existed at Memphis and Deir el Medina, but these have not been found. Those who lived by the laws of Ma'at took a sacramental drink which conferred ritual purity in the same sense as the Christian Holy Communion. Like baptismal water of life, Ma'at's potion brought life after death to the peaceful and law-abiding, but death to violent persons. Ma'at gave the breath of life to the gods. Some say she was the daughter of Ra. Later depictions show her as the consort of Thoth, who shared some of the same attributes as her. Ma'at can be represented in hieroglyphics by just the feather itself. However, this can be misleading because the feather can also be used to symbolize the air god Shu. A closer look at the context is required to determine which the image represents in a specific situation. For a longer name, the loaf symbol (semicircle) which indicates a female and the image of the seated goddess can be added. There are other ways that Ma'at can be identified in hieroglyphics. Sometimes the seated goddess figure has a feather on the top of the head. In funerary scenes and pictures depicting the underworld, the figure of Ma'at or her feather was placed on the opposite side of the scale from the heart of the deceased. If the scale balanced, the deceased was allowed to go on to the afterlife. If not, s/he was given to Ammit to devour. Thus the feather of Ma'at itself became a hieroglyph for "truth". In the excerpt from a funerary scene to the right, Ma'at appears twice. Her head appears on top of the scale, at the center. The feather representing her appears on the right-hand cup of the scale. As usual, the feather is shown as being heavier than the deceased person's heart. Although the funerary scene above shows just a feather on Ma'at's side of the scale, some variations of the scene show the goddess in a seated position, such as the drawing to the right. Nekheb was the site of an ancient necropolis (cemetery), and housed the oldest oracle in Egypt. The ancient Egyptians viewed vultures as being excellent models of motherhood. Therefore, the vulture became honored as a symbol of motherhood, and the name of the vulture goddess, Nekhbet, was also the word for "mother". In Egypt, the queen was seen as the mother of the next Pharaoh, and therefore both mortal queens and Isis were often portrayed as wearing the vulture headdress symbolizing Nekhbet. 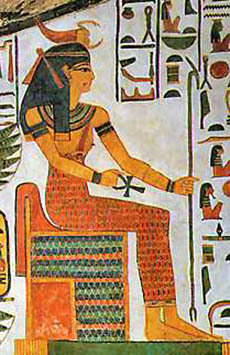 In the papyrus image to the right, the mortal Queen Nefertari is shown wearing the headdress of Nekhbet. Nekhbet spent much time at the palace, where she nursed the royal children, including the Pharaoh. When the Pharaoh was grown, she accompanied him into battle, hovering over his head in the form of a vulture. Nekhbet was closely associated with her sister Wadjet, the cobra goddess, and together they were known as the Nebti. As a pair, they represented cycles of birth and death, beginning and ending. The name Nekhbet means, "She of [the town of] Nekheb." 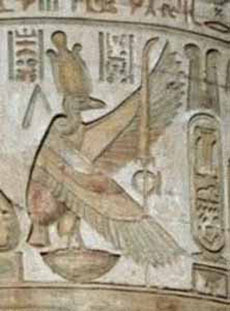 In art, Nekhbet was usually represented as a vulture as shown in the photo to the right or as a woman with the head of a vulture. 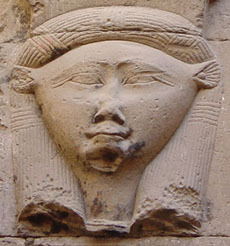 Sometimes she was depicted as a woman wearing the white crown of Upper Egypt (southern Egypt), perhaps with the vulture headdress over her hair, as shown above. 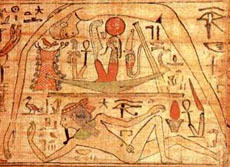 In the illustration to the right, Nekhbet and Uadjet are guarding the Eye Of Ra, the Utchat. 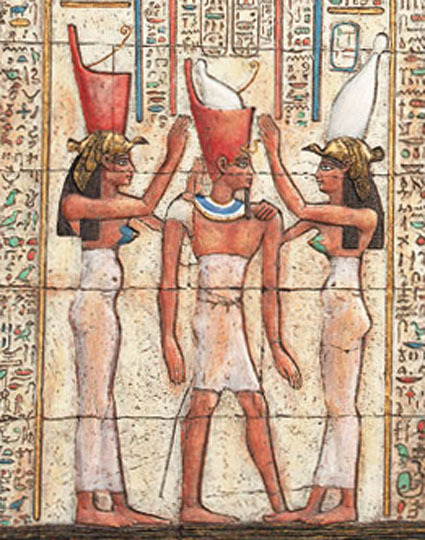 Nekhbet is wearing the white crown of Upper Egypt, and Uadjet is wearing the red crown of Lower Egypt. Together, they were known as the nebti, or "two ladies". 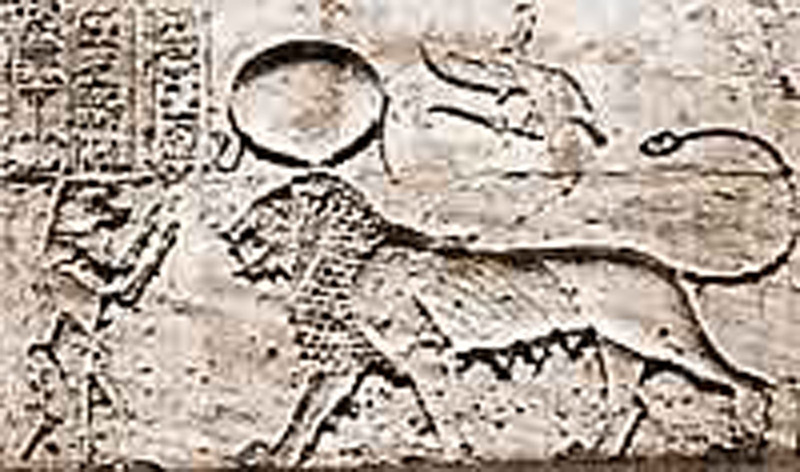 Images of Nekhbet, including the one shown to the right, often depict her carrying in her claws a circular object with a horizontal bar across one side. This object was known as the shen ring, and it symbolized eternity. Nekhbet sometimes appeared in funerary scenes such as the one to the right, hovering over Osiris as he was approached by the deceased. Wear a vulture-shaped headdress draped over the hair. Wear a white crown in the style of Pharaohs from Upper Egypt. 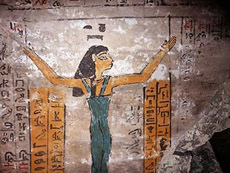 In art, Nekhbet is typically portrayed together with her sister Wadjet, who represents Lower Egypt. Therefore, a piece could portray two dancers or actresses working together. Carry a shen symbol (a ring with a bar across one side). Rituals that commemorated the murder and resurrection of Osiris included Nephthys as an important participant, due to her role in the legend. Nephthys was honored in funerary rituals as a guide who gave guidance and assistance to the newly deceased. 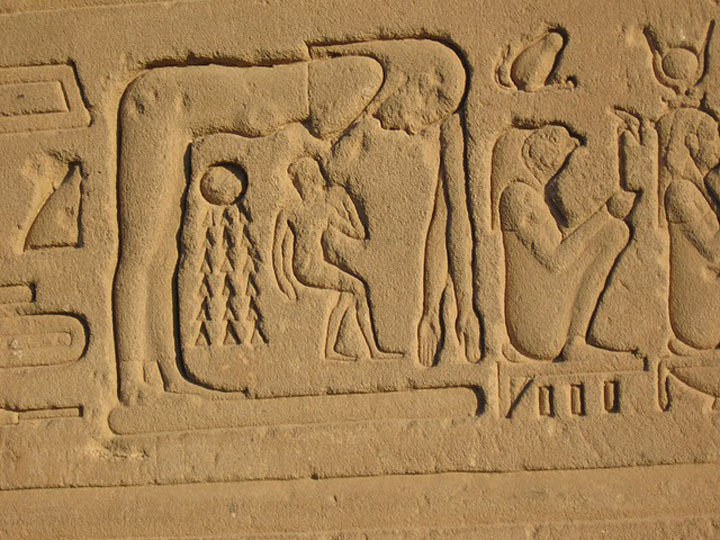 Images found at Edfu, Dendera, and Behbeit depict Nephthys receiving offerings of beer from the Pharaoh, and therefore beer consumption was often part of her rites. Nephthys was the personification of darkness and all that belongs to it. She was the daughter of Nut, and sister of Isis. After Set murdered Osiris, dismembered him, and strewed his body parts throughout Egypt, Nephthys helped his wife Isis search for the pieces. She was also one of the goddesses linked to nursing the infant Horus. The name Nephthys means, literally, "Lady of the House", but not in the sense of a dwelling where people live. Rather, the "house" referred to would be a house of worship, a building on the grounds of a temple complex. Therefore, her title is referring to her as being in the role of a priestess rather than that of a homemaker. The "house and basket symbol" can be used by itself. Optionally, the semicircular loaf symbol and the seated goddess symbol can be added. Nephyths appears in funerary scenes, standing next to Isis, just behind Osiris. Her name means, "Lady of the House," and the hieroglyphic symbols for her name (a house and a basket) appear on her head. Wearing a headdress resembling the one that is typically depicted in papyri, temple walls, and tombs. Because Nut was regarded to be a cosmic deity, she wasn't worshiped as a "person" the way other goddesses were. Myths identify Nut as the mother of Osiris, Isis, Nephthys, Horus the Elder, and Set. Nut gave birth to the sun every day and swallowed him every night. In this way, she controlled the passing of time. Ra asked Nut to raise him into the heavens to remove him from the world, which he found distasteful. Carrying him on her back, Nut rose upward, but the higher she reached, the dizzier she became. She would have crashed to the ground if four gods had not steadied her legs and Shu held up her belly. These gods became the four pillars of the sky, and Nut's body became the firmament, to which Ra attached the stars. Some believe that the pot symbol in Nut's name also stands for the uterus. The pot can be used by itself to represent Nut. In art, Nut is most commonly portrayed arched over the world, balanced on her hands and feet, as shown in the relief to the right. Sometimes, as shown above at the beginning of this section, a god is shown holding Nut up with his hands. This is Shu, the god of the air. 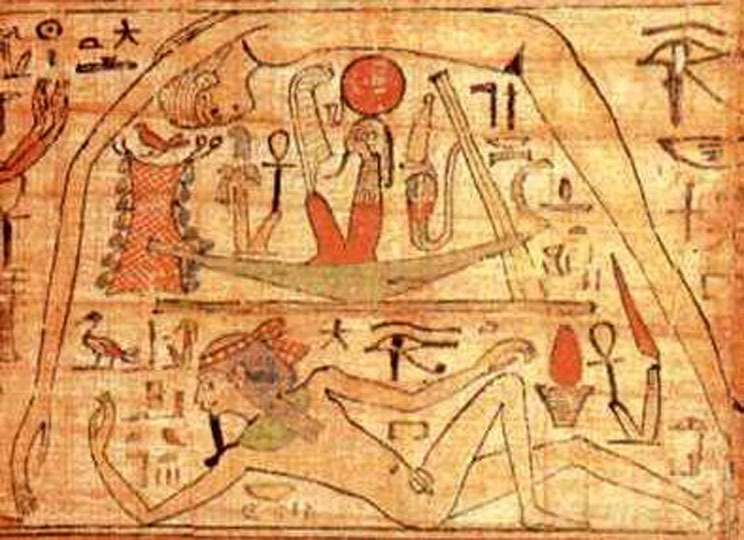 He separates Nut from her husband, the earth god Geb, who is depicted as a reclining man beneath Nut. 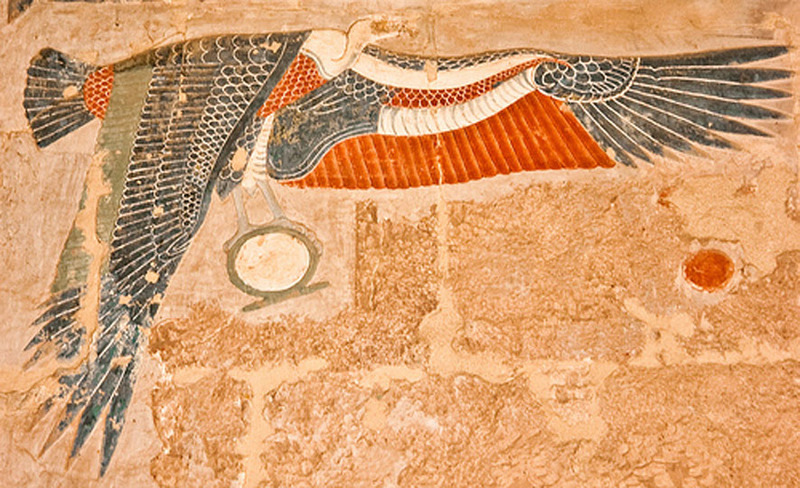 Nut is sometimes confused with Isis, because some images show her with wings. The best way to identify whether a winged goddess is Nut, Isis, Ma'at, or someone else is to look for the hieroglyphics appearing near her head. 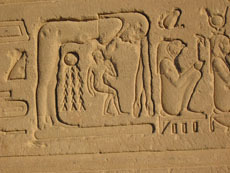 In this specific image, just above the goddess' head is Nut's name in hieroglyphics. On occasion, Nut may be depicted as a woman standing or sitting normally. In these cases, her name typically appears in hieroglyphics somewhere near her head, as shown in the image to the right. Less frequently, Nut is depicted as either a sow or a cow nursing young ones. In the Valley of the Kings, several tombs contain blue ceilings with 5-pointed stars painted on them. These reach down the walls on either side, ending with Nut's feet on one side of the passage, and her upper body on the other. Consider wearing a long-sleeved blue unitard, with light yellow 5-pointed stars drawn on it. Alternatively, a white shift dress could be worn, with a pot balanced on the head. Bring the stars of the night sky into the scene in some way. When Upper Egypt in the South conquered Lower Egypt in the delta area, the Pharaoh brought the cult of Sekhmet with him. She was viewed as a replacement for Bast, who was deemed to be less powerful because Sekhmet's Pharaoh had conquered Bast's territory. Sekhmet, the warrior goddess of Upper Egypt, was the wife of Ptah and mother of Nefertum. On the battlefield, Sekhmet embodied the strength and bravery of the lion, expressing unbounded delight in the prey that fell to her. She was believed to protect the Pharaoh in battle. She was sometimes known as "the scarlet lady" because of her lust for blood. Sekhmet was sometimes known as "the eye of Ra". As the sun god Ra grew older, he became concerned about his enemies and asked Hathor to help him. She took on the job with a vengeance and turned into Sekhmet, the lioness goddess. She took delight in killing people and drinking their blood. Ra then worried that Sekhmet would wipe out the entire human race, so he arranged for red dye to be mixed into ale and spread about the land. Sekhmet, thinking it was blood, drank it and became so intoxicated that she forgot her assignment. As a result, humankind was saved. Pacified by the beer, she resumed her persona as the beautiful Hathor and returned to Ra. The first symbol in Sekhmet's name is the scepter, which means "powerful" or "violent". It is known as the sekhem. The loaf symbol (semicircle) indicates the female gender and is pronounced as "t". The seated woman represents the fact that this is a goddess, but does not have a pronunciation associated with it. 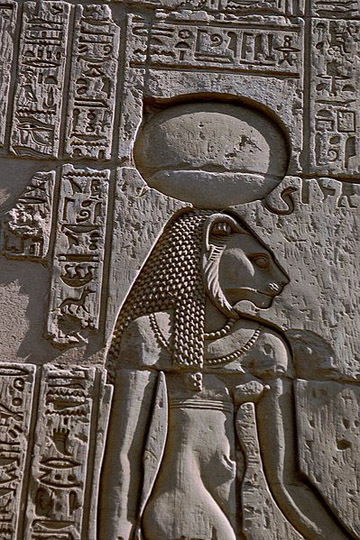 Another lioness-headed goddess was Tefnut. One way to tell the difference between them is to look at their names in hieroglphyics. Another way is to look at the ears. Sekhmet has rounded ears, whereas Tefnut has pointed ones. 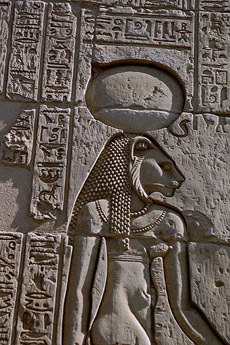 In art, Sekhmet, known as "The Powerful", was portrayed as either a lion or a woman with the head of a lion, often holding an ankh or a sistrum. Wear a headdress that looks like the sun disk, including the Uraeus (cobra). Wear a red dress in reference to her title of "the scarlet lady". Carry an ankh or a sistrum. Wear jewelry depicting the Eye of Ra. Depict a battle, representing Sekhmet as an archer. To date, archeologists have not yet found any temples dedicated to Serket. Serket's primary role was that of the goddess who guarded people against potentially fatal scorpion bites and assisted with curing those who suffered them. In this way, she came to be associated with a more general role of healing, particularly in protecting people from poisoning. 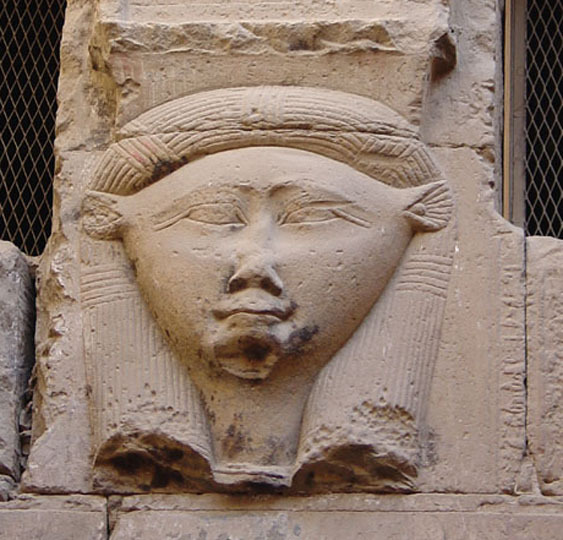 Due to this association with protection against poisoning, Serket was believed to be the goddess who guarded the son of Horus responsible for the canopic jar containing the deceased person's intestines. This led to her becoming associated with funerary functions. According to legend, Serket is one of the goddesses who assisted Isis at the birth of Horus. In particular, Serket was charged with protecting the infant against scorpions and other potential sources of poisoning. Through this, she became one of the goddesses from whom women sought assistance in childbirth. When the evil snake god Apep participated in an attack against the sun god Ra, he was defeated and sent to the underworld. Serket was given the duty of guarding him. Because Apep was bound with chains, Serket became known as the goddess who binds the dead with chains. Serket's name means "She who causes the throat to breathe." Some scholars believe that this is a reference to her role as the patron of healing from scorpion bites. The deadly variety of scorpions found in Africa can produce a bite that causes difficulty breathing. The horizontal line in hieroglyphics represents a door fastening, and would be pronounced as a "z". Just below it is the symbol for "mouth" which is pronounced as an "r". The semicircle signifies female, and would be pronounced as a "t". The goddess symbol is not pronounced, it simply identifies that this name is referring to a goddess. Some variations of Serket's name include the scorpion symbol. In art, Selkhet appeared as a woman with a scorpion on her head, as a scorpion with a woman's head, and sometimes as a scorpion holding an ankh. The statue in the photo to the right was found in King Tutankhamen's tomb. This is by far the most widely-seen image of Serket. No temples dedicated specifically to Taweret have been found. In childbirth, Taweret suckled and protected the newborn. In the underworld, she carried the deceased toward a new destiny. Taweret's name means, "The Great One". In art, Taweret appeared as a hippopotamus standing on her hind legs with pendulous breasts, sometimes with the back of a crocodile and the feet of a lion. In her role as an avenging deity, Taweret had the head of a lion and the body of a hippopotamus, brandishing a dagger, and sometimes carrying a crocodile on her shoulders. Taweret was often portrayed with one hand resting on the sa symbol, which represented protection. Wear a cape painted with a large image of a crocodile. Place a platform resembling the sa symbol on stage. Wear a sun disk headdress. Pad the abdomen as if pregnant. Tefnut helped support the sky, and each morning received the sun on the eastern horizon. She was one of the "great nine" who sat in judgment of the dead, and therefore frequently appeared in funerary scenes. She was considered the goddess of the second hour of the night of the fourteenth moon. Tefnut is credited with being the mother of the twins Nut (the sky goddess) and Geb (the earth). In the mythology of Heliopolis, the first event of creation was the emergence of the god Atum from the chaotic wastes of Nun. He gave birth to his son Shu by spitting him out, and to his daughter Tefnut by vomiting her forth. Shu and Tefnut were brought up by Nun and looked after by Atum's Eye. Atum had only one eye, and it was physically separable from him and independent in its wishes. Shu and Tefnut became separated from Atum in the dark wastes of the waters of Nun. Atum sent his Eye to look for them and eventually Shu and Tefnut came back with the Eye. While the Eye had been searching for them, Atum had replaced it with another, much brighter one. 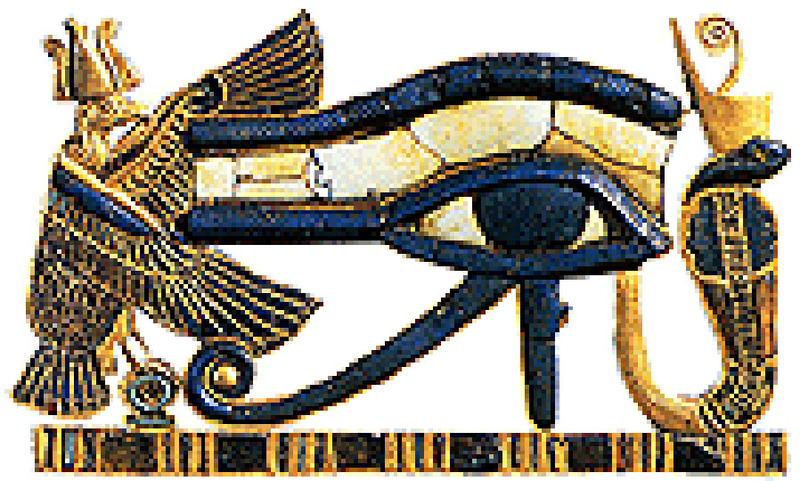 The original Eye was enraged with Atum when it returned at finding its place had been usurped. So Atum took the first Eye and placed it on his forehead where it could rule the whole world he was about to create. Once, Tefnut left Egypt and went to live in the Nubian desert, taking all the moisture in the atmosphere with her. Egypt suffered from a drought. While there, Tefnut turned into a lioness and went on a killing spree. Ra was lonely without his daughter and sent her husband Shu and the baboon Thoth to ask her to return to Egypt. She came back, bringing with her the inundation of the Nile and there were great celebrations in all the temples. The name of Tefnut translates to, "She of the mist". The syllable "TF" refers to moisture or spittle, and is written using the symbols for a loaf of bread ("T" sound) and horned viper ("F" sound). The second syllable, "NT", contains a pot symbolizing water for the "N" and another loaf for the second "T". In art, Tefnut usually was portrayed as a lion-headed goddess with a solar disk on her head, or as a woman, or as a lion. As one of the nine deities who sat in judgment of the dead, Tefnut often appeared in funerary scenes, seated in a row with the other members of the panel. In these, she was typically depicted as a woman, and could be identified by looking for her name written in hieroglyphics near her head. Wear a headdress of the solar disk with two Uraeus (cobra) heads, one in center front, and the other in center back. Carry either an ankh or a scepter. Bring water or clouds into the set design in some way. Use dry ice to create the effect of mist. Wadjet figured prominently in the coronation ceremony and in the underworld, where she endowed justice and truth and destroyed the enemies of the deceased. Wadjet was the goddess of the fifth hour of the fifth day of the moon. An oracle operated in the goddess' name in the temple Per-Wadjet. As her sister Nekhebet was the motherly protectress of the Pharoah, so Wadjet was his aggressive defender. When Isis was hiding in the swamps with her baby Horus, Wadjet came to help her protect him. Uadjet's sister was Nekhebet, and together the two were known as the Nebti. They appeared together in art to represent the unification of Upper and Lower Egypt. Wadjet's name was written using the symbol of a cobra. Sometimes the cobra would be sitting on the symbol of a basket. In art, Wadjet often appeared with her sister Nekhmet, together guarding the Eye of Ra. 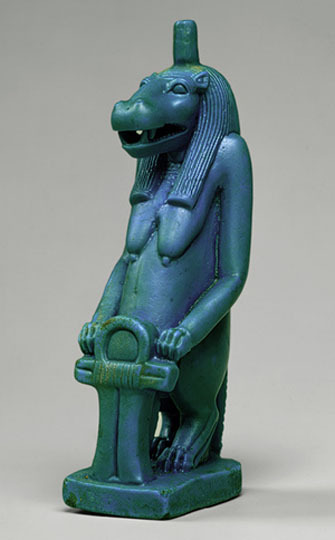 Nekhmet, as a vulture, wore the white crown of Upper Egypt while Wadjet, as a cobra, wore the red crown of Lower Egypt. When depicted by herself, Wadjet usually appeared as a cobra, sometimes winged and crowned, and sometimes as a snake with the face of a woman. She was the Uraeus (cobra-shaped symbol of sovereignty) that appeared on the headdresses of the Egyptian Pharaohs and deities. Wear a crown in the fashion of the red crown of Lower Egypt. Move with a sinuous, snake-like quality. Egyptian Myths: The Legendary Past. By George Hart. A compact introduction to Egyptian mythology. Egyptian Mythology. By Veronica Ions. From the Library Of The World's Myths and Legends. This one has a particularly excellent index, and the scholarly aspects don't get in the way of telling a good story. Many illustrations. Goddesses In World Mythology: A Biographical Dictionary. By Martha Ann and Dorothy Myers Imel. Lists thousands of goddesses from mythological systems worldwide, presented in dictionary format. Chapters are organized by region, with one entire chapter dedicated to ancient Egypt. Making an Egyptian Pharaonic Costume. Instructions by Arabella.